What is the 'Temple of the Whills' in Rogue One? Rogue One features a place on Jedha called 'Temple of the Whills'. This use of the the 'Whills' concept is great reference of Easter egg that refers to an idea that George Lucas developed when he was writing his first drafts of what became A New Hope. The Whills are a race of people that oversee the entries into the 'Journal of the Whills'. They are in effect an ancient order that record the history of the universe. Rogue One's use of the word Whills makes this unused idea by George Lucas formal Star Wars canon. Uptil now, it was and old script idea he had. For A New Hope, Lucas was trying to tell a story that was found in his version of the Whills. Lucas said that he considered the information that went in the Journal was relayed by R2D2 himself to a 'Keeper of the Whills' some 100 years after the Emperor was defeated in Return of the Jedi. While drafting Star Wars, Lucas decided that his concept of the Whills wasn't fitting into the story he was trying to tell and he began to focus on the concept of the Force instead. "Originally, I was trying to have the story be told by somebody else; there was somebody watching this whole story and recording it, somebody probably wiser than the mortal players in the actual events. I eventually dropped this idea, and the concept behind the Whills turned into the Force. But the Whills became part of this massive amount of notes, quotes, background information that I used for the scripts; the stories were actually taken from the 'Journal of the Whills'." The Whills were actually first mentioned in the Alan Dean Foster novelization of the first Star Wars movie (Foster also wrote The Force Awakens book and the truly classic, Splinter of the Mind's Eye, which was based on ideas Lucas had for a sequel to Star Wars). 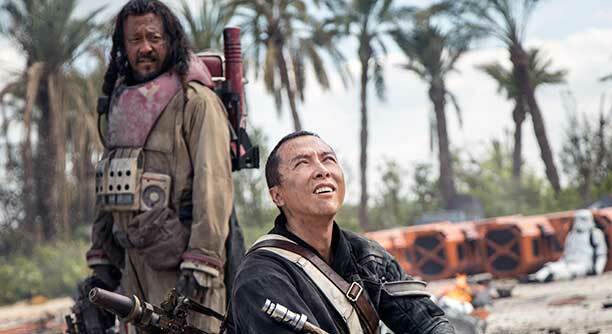 So in Rogue One, Baze and Chirrut Imwe are refered to by Andor as Guardians of the Whills. They appeared to have a role of making sure the kyber crystals kept in the Temple of the Whills were made safe. Seems like the Imperial Army muscled them out and abused the Temple's crystals to help make the Death Star's weapon.